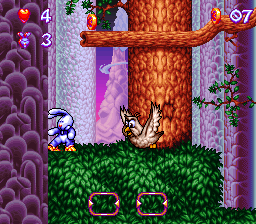 Quik The Thunder Rabbit is a game that was released on Amiga in 1994 by Titus, and developed by Stywox. A ROM image of a SNES game based on this property was leaked in February 2017. Since I don’t know the legal status of the project (told you I don’t know much about the game) but I know how can strict devs/publisher deal can be. I don’t want to put my source in trouble. Slightly editing the rom can a bit hide that. As a technical note, the header information identifies it as a NTSC game. However, after playing this a bit, I think the game is clearly optimized for a PAL console. 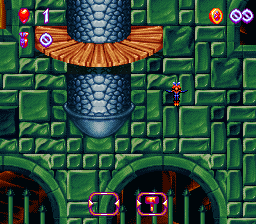 This is apparent in the third level, which is an auto-scroller. At NTSC speeds, the level is essentially not beatable, because you die if you cannot keep up with the scrolling. At PAL speed, it is still hard but not impossible. 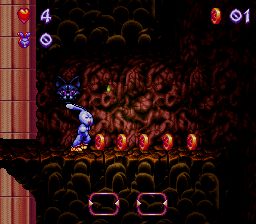 The game also controls a lot smoother in PAL mode. In the download, I have included a Higan compatible folder that allows you to play the game in PAL mode. As a technical note, the header information identified as a NTSC game. However, after playing this a bit, I think the game is clearly optimized for a PAL console. 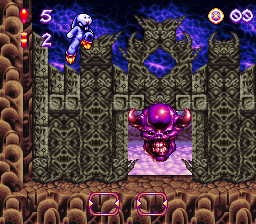 This is apparent in the third level, which is an auto-scroller. At NTSC speeds, the level is essentially not beatable, because you die if you cannot keep up with the scrolling. At PAL speed, it is still hard but not impossible. 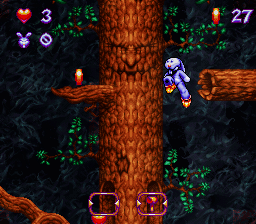 The game also controls a lot smoother in PAL mode. In the download, I have included a Higan compatible folder that allows you to play the game in PAL mode. This prototype is clearly not close to competition. It lacks music, and only the first couple of levels appear to be complete. If you press "R", you can skip ahead to the next level. The levels in the prototype do not correspond to anything in the Amiga game, so I would assume this game was probably a sequel. As such, we cannot assume that "Quik the Thunder Rabbit" is what the final game would have been called. 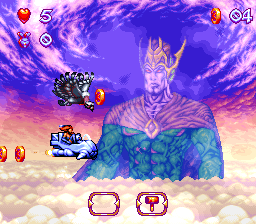 The game also has some really bizarre parts in it, notably the gory demon at the start of the third level and the weird fighting still at the end of the game. I would assume this was just some joking around on the part of the developers, and this would not have been part of the final game. The game engine itself seems pretty much finished, at least for the platforming levels. In the Assembler Games thread, user pichichi010 states that the developer Stywox went bankrupt, which seems like a pretty reasonable guess as to why this game was never finished. 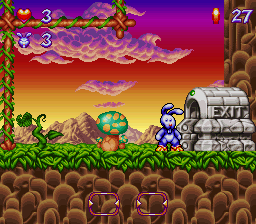 Seventh level - Pressing "X" lets you control this fairy bunny girl. Clearly there are holes that she is supposed to fit in, but they aren't programmed in yet. I don't think you can beat this level. 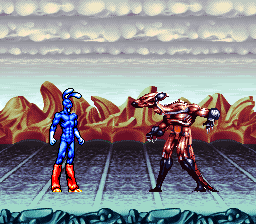 Truly bizarre fighting game still image, with what appears to be a strange corpse and a ripped anime-style Quik.